We take care of the stamping for you.Our artisans craft authentic wax seals finished to perfection. We have been crafting seals and stamps since the 1980's. Our aptitude for craft is stamped fast in everything we do.We take pride in creating the perfect impressoion.We believe that the smallest of details can make the greatest impact. Written correspondence should be personal and intimate,therefore we must take time to craft our impression onto that which we send into the world. We are leading manufacturers for Sealing Wax Since 1973 and have a Wide range of Sealing Wax based on quality and texture of the wax. The most widely used is the Red Sealing Wax and had varied application from sealing envelopes to wine bottles , to add as subsiture in fillers in Jewellery Making moulds. 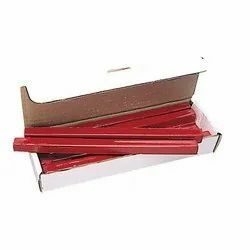 The Sealing Wax in Red color starts at Rs 25 Per Packet and Goes upto Rs 850 a packet depending on the quality and quantity of the sticks in a packet. The Wax Seal Coins are available in Variety of Colors and are the Quickest & Most Efficient Method for Sealing your Invites. Cut small piece of sealing wax onto the spoon and melt it by the white candle. Put the stamp on the wax slowly, and wait 30 sec before taking it out. 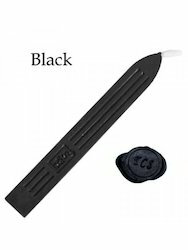 There are multiple usages of Black Sealing Wax that are ideal for tinkering work in artisan industry. It is water proof and long lasting. It makes the finished product durable and long lasting. They are used in artifacts, invitation cards and by viticulturists. The use of superior raw material helps in enhancing the quality. We ensure that the clients get nothing short of best quality.